Finally! 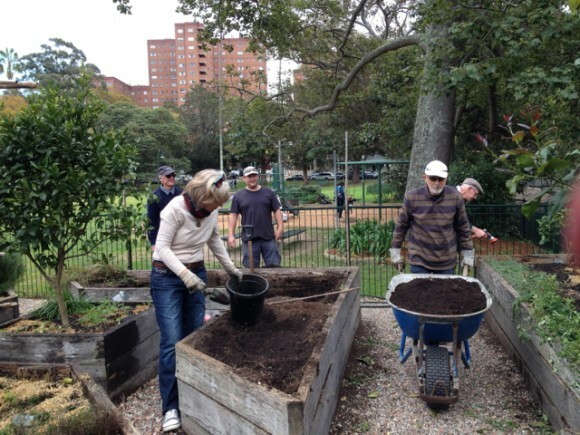 we have a brand new garden bed rebuilt with a generous support from North Sydney Council. 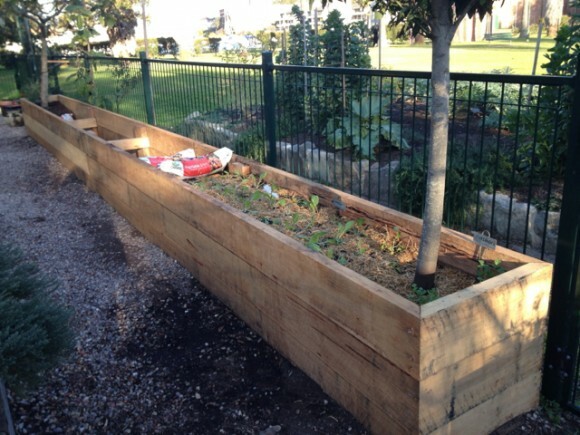 As many of you might have been aware, we need to repair some of the garden beds due to the timber deterioration. Thanks to Martin and Colin who have been in talks with the council to go forward with the project, the carpenter neatly built a new bed around the existing tamarillo tree and the bay tree by the gate, which Colin replanted quickly. So far both trees look fine though we’ll need to keep an eye on their wellbeing during the growing season. Another bed near the children’s playground and a few timbers will be repaired or fixed in due course. 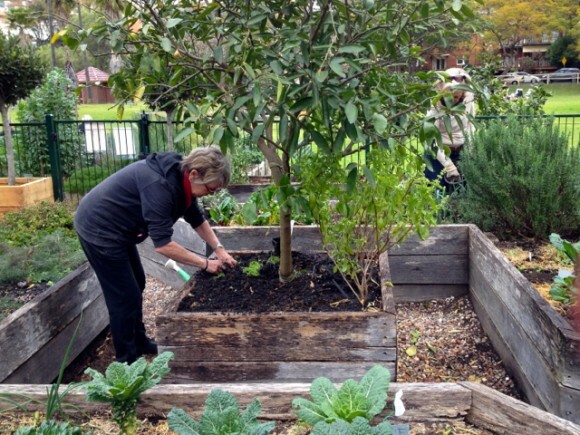 Many thanks to Wendy and other regular volunteers for their work and care while I was sick with a flu, the new bed was planted with silverbeet and coriander seedlings last week. 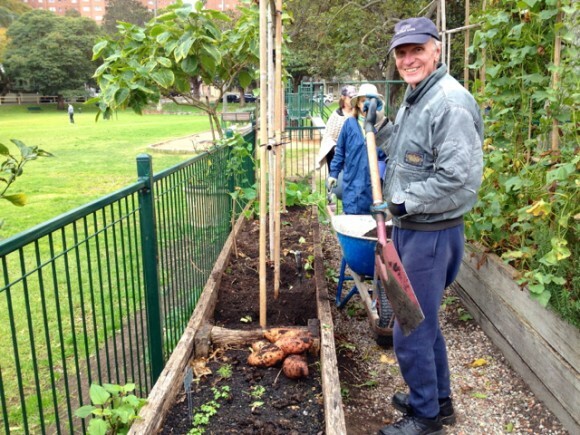 Today Bruce, Colin and John Julian carried loads of soil from one bed to another while our new watering man John Eager watered the whole garden singlehandedly – thanks! The new bed was then filled with more seedlings such as Japanese Komatsuna spinach, dill, Heartsease edible flower and spring onions. We have also planted soy beans, snake beans, sun baby beans, and seedlings of truss plum tomato, orange pixie tomato, curly parsley, water cress into other beds and pots while more lettuce and marigold filled the gaps. 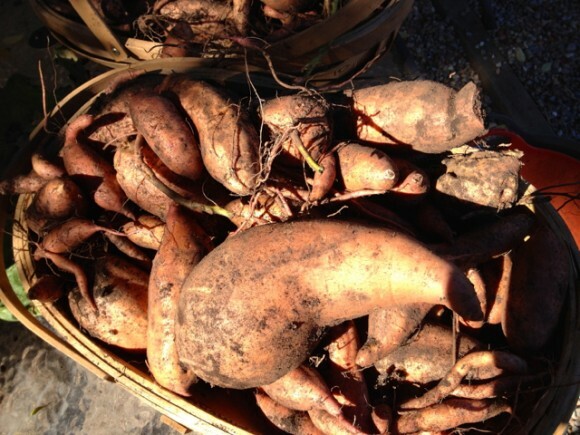 Over the last couple of months, we have enjoyed a healthy harvest of sweet potatoes among other winter vegetables. 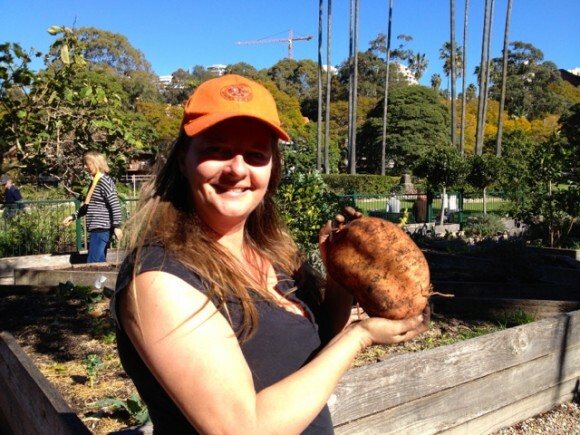 See photos of our young sweet potato digger Finn proudly holding his prize and Averil with her discovery. The sweet potatoes were beautiful simply roasted with salt and pepper with a pinch of rosemary! 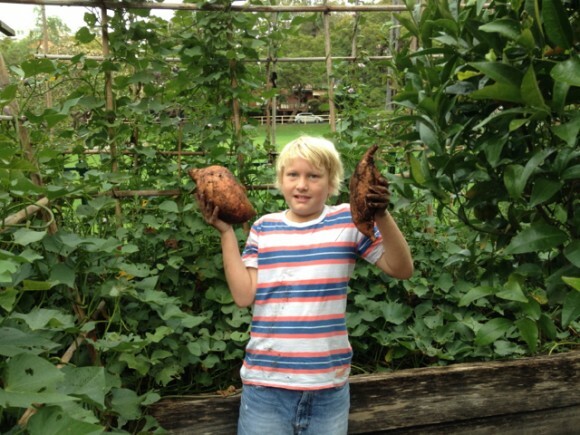 Last month Peter encountered a surprise harvest of Jerusalem artichoke while he was digging a bed. A few months after the initial harvest, heaps of tubers were still hiding at the bottom of the bed looking very fresh! 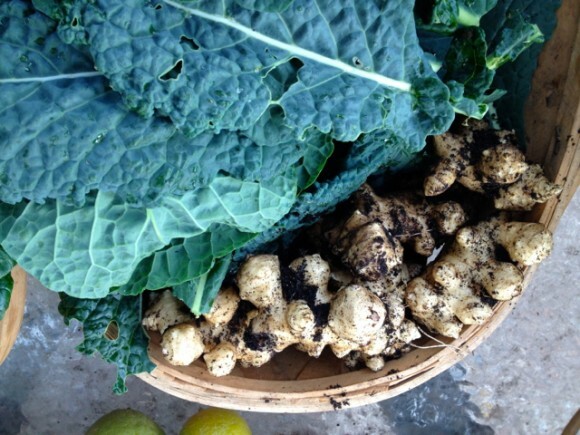 In spring we shall plant some of the sweet potato and Jerusalem artichoke tubers again as they proved to be very easy to grow and successful over the years. 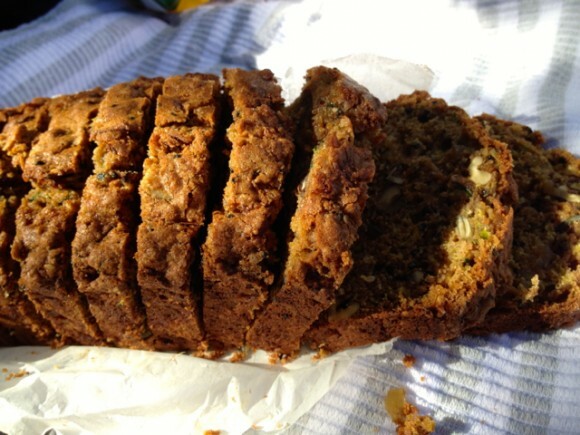 In my last post in May I mentioned Susie and Sandy Lockhart were looking for someone else to take over their worm farm. However, after some consideration The Lockhart has decided to keep it going with the help from their family. 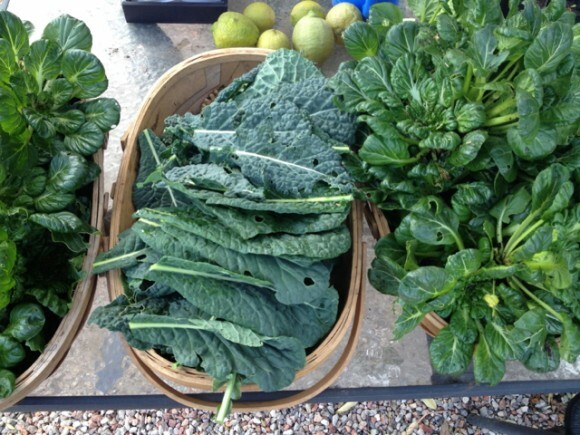 So we are still fortunate to have their regular donation of worm wee and humus which we use to enrich the soil. We thank Susie and the family for their decision and wishing all the best. Thank you everyone for your interest and help in the garden! See you soon.